Well dear readers, this is the most crucial month of the year, as far as football goes. You either will this week or already have decided your fantasy football playoff fate, your NFL team is either a lock, a sure miss, or a bubble playoff team, and your college team is either in a meaningless bowl game, or fought their way into the exclusive four team playoff. The Oregon Ducks found their way into the Redbox bowl (wait, that exists? ), and with NCAA sanctions being handed out to the Ducks’ entire athletic program this week, we here at Fireside Sports believe that game should be pay per view only, and give viewers the option to pay $1 for standard definition, or $2 for high definition. The game must be returned within 24 hours or double your money. Not quite sure how that will work, but the folks at Redbox can figure it out. The Seattle Seahawks are down to their last four games, and only two of them really matter. With looming home showdowns against Minnesota and Kansas City, the team can lock in a wild card playoff berth, or watch another season pass them by. To answer all of the questions you have about what will happen to the only NFL team in the NW (some love them, some don’t, some are indifferent. This is true of all things.) and what to expect in the coming weeks, we asked Fireside Sports co-hosts Casey and Bryant to offer their thoughts. So happy holidays, and best wishes to your team and your fantasy teams, good luck to all. Without further ado, here is this week’s lightning round! Seattle is 7-5 and controls their own playoff destiny. The Seahawks opened the season as a team looking to rebuild, but could now be a playoff dark horse. What are your revised expectations of this surprise team? (CM) My revised expectations are that this is a team that can hang with anyone. The only Achilles heel they have is they seem to like to play up or play down to their competition. Playing up is great – every fan’s dream made true as no opponent is out of their range. But playing down can get messy, especially as the games matter more and more. They need to make sure they don’t have any costly mistakes down the stretch that cost them games which will directly translate to missing a potential shot at the playoffs. They only have one road game left, two of their next four games are huge, and the other two are “gimmes”. They need to make sure they do more than go through the motions against the Cardinals and 49ers. In order to clinch a spot, 2-2 is the least they can do, but 3-1 should be the target. Once they get in, they travel as well as any team, and I wouldn’t count them out regardless of the opponent. But they have to make sure they don’t miss a beat after blowing the lid off most people’s preseason expectations. I had them at 6-10 at best, they have easily beaten that and could finish as a 10 or 11 win team. (BK) I’m trying to keep expectations tempered considering this is a strange case of Jekyll and Hyde that could reverse course at any moment, but I’ll give the team the benefit of the doubt and say they’re genuinely improved and not just riding a hot streak. Expectation is now to make the playoffs and compete. I’m not going out on a limb and saying they’re destined for Atlanta, but with Russell Wilson leading the show and everyone from his o-line to his weapons to his defense following suit, simply getting to the postseason isn’t going to make anyone in Seattle happy. With Minnesota coming to town for Monday Night Football, Seattle has a chance to put some distance between them and what might be the only team that can leap them for the #5 seed. How big is this game, and who do you expect to win? (CM) This game is huge, maybe the “hugest” game in the history of MNF. Not really, but this game is as “season on the line” as it gets. 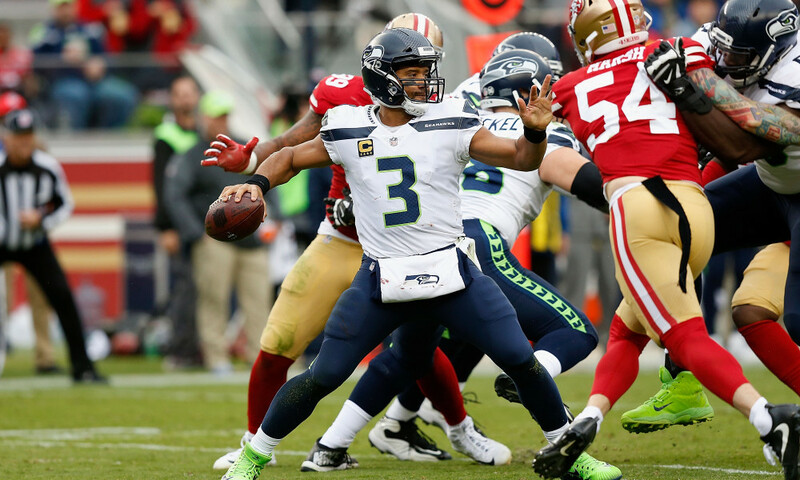 The Seahawks drew a home game, an extra day of rest, and the chance to put another game between them and the team with the best shot to knock them out of the #5 seed. Minnesota is a complete team and travels well, but Seattle has proven that the mystique of CenturyLink did not leave with their Super Bowl roster, and the home crowd still holds sway over any opponent. It isn’t the greatest home field advantage in all of sports any more, but it’s still a top-5 home field advantage in the NFL. The Vikings are probably in for rough weather, bitter rival fans, and an overall hostile environment. Seattle has what it takes to control this game, and could give themselves some much needed buffer in the wild card race. I think Seattle wins a close game, and while it won’t be a shootout, it won’t be low scoring either. Not to sound trivial, but I don’t think this is a game either side will put away before the end of the 4th quarter. (BK) Seattle has opened this game as 3.5-point favorites, which feels about right. The Vikings are coming off a bad loss to the New England Patriots and they’re just 1-7 against the spread in their last eight contests versus a team with a winning record (as much as folks wanted to talk about Tom Brady’s scramble to eclipse 1,000 career rushing yards and his even more epic lunging-forward knee to preserve the accomplishment out of the victory formation, it was a very real late-season football game with very real consequences). Minnesota has lost three of its last five, but its defense will be good enough to prevent anything resembling a blowout, even if the team ultimately falls on the road. The Vikings boast one of the best all-around defenses in the NFL, and can stop the run as well as the pass. Seattle is pretty well rounded in both rushing and passing, which do you expect them to have more success with? (CM) Seattle has an underrated passing game, don’t let the statistics fool you. This team is sneaky good, and can score on anyone. They live by opening up the pass via the run, and could have some trouble with that given how good the Vikings are against the run. Chris Carson doesn’t have a wide array of moves, but he is great at getting the yards he is presented with. Rashaad Penny and Mike Davis do a great job filling in when Carson needs a break, and both have unique skill sets that keep the defense on their heels. In the passing game, no one player is the key, but they do a lot of things well, run good routes, and do a good job of getting open – all of which keeps opposing secondaries on their heels and from keying on any one target. As long as Russell Wilson gets quality blocking, and that has been the case in recent weeks, this Vikings secondary is not as strong as it was last year, and definitely not if shutdown corner Xavier Rhodes is at less than full strength. I expect the Seahawks to open with the run, use play action to get some easy yards, and put some distance between them and the Vikings on the scoreboard. Then they can put pressure on the Minnesota offense to score quickly while they run the ball to kill the clock. Of course this all sounds great in theory, but Seattle will adjust and adapt if the Vikings prove to be prepared for such a game plan, and then the Seahawks can just find another way to win. It’s worked before, it can work again. (BK) The Seahawks are 26th this season in passing offense. (Sorry, Casey—numbers don’t lie!) You know where they sit in the rushing category? That would be in first place—by a wide margin. Seattle will need to use its ground attack to set up something aerial. The Vikings sit top 10 in both passing defense and rushing defense; lulling them to sleep with the running game won’t be an option—Minnesota is too good and too prepared on that side of the ball. But all it takes is one big play through the air to get them to change their approach. Still, though, don’t expect the pass game to be what makes or breaks this contest for Seattle—just what could ultimately break it open in their favor with one or two big plays. Vikings QB Kirk Cousins has had an up and down season, but has proven he can light up the scoreboard when his team needs it. Do you think this will be a low-scoring defensive game, or an offensive showcase, or somewhere in between? (CM) It’s going to be a medium scoring game. Next question. Ok you want more? It’s going to be something like 24-20. Not challenging the Rams-Chiefs in scoring, and not the Jaguars-Colts dud either. There are going to be more three and outs than scoring drives, but that won’t matter to the team that wins it. This may not go down as the most entertaining prime time game, but on paper this has the ingredients for a quality game. If both teams show up to win, there will be enough fireworks to satisfy the casual fan even if there aren’t many points. (BK) Low scoring, for sure. I think you get one or two big plays from Russ that make it worth the price of admission, and if Adam Thielen is healthy, he’ll likely get back on track to Death and Taxes status with his 100-yard games. But this game is going to come down to Seattle’s run game vs. Minnesota’s defense, and whenever that’s the case, you can count on it being a grind-it-out kind of contest. After the Vikings, Seattle only has one quality opponent renaming – THE Kansas City Chiefs. Do you think they can give their fans an early gift and win one over the NFL’s #1 scoring offense on Christmas Eve Eve? (CM) I would wager that most folks will count this game as an easy win for the Chiefs, and that would be foolish. It will be cold, possible chance of snow or rain, and a very hungry Seattle team that would love to knock off the world beating Chiefs. Go back to an early December MNF showdown with the Saints in 2013 if you need inspiration. The home crowd was rocking, the field was a wet hot mess, and the defense couldn’t be touched. You may not see something of that caliber, but if Seattle hasn’t already locked in a playoff spot by this game, they will be even hungrier while the Chiefs may not have anything to play for but it will still be a week early to rest their starters. Barring any key injuries or slumps, I like Seattle’s chances against any team at this point, regardless of what the stats or odds makers tell you. I didn’t believe in them before the season, but they have earned my trust at this point. It feels like 2012, and I wouldn’t count them out until their season ends. (BK) At this point, you can’t count out the Seahawks—and that’s before you consider the Chiefs are dealing with adversity that goes well beyond football. If you’re a KC fan, you’re hoping that the locker room can unite and come together during tough times. If you’re a 12, you’re looking at Seattle’s recent success and expect the momentum to continue. This Hawks team has played up to its competition at key points in the year. I expect that to continue with a season-defining win.